I love my iPad. I use it every day but one thing that frustrates me is that every web site I go to tells me they have a dedicated app. 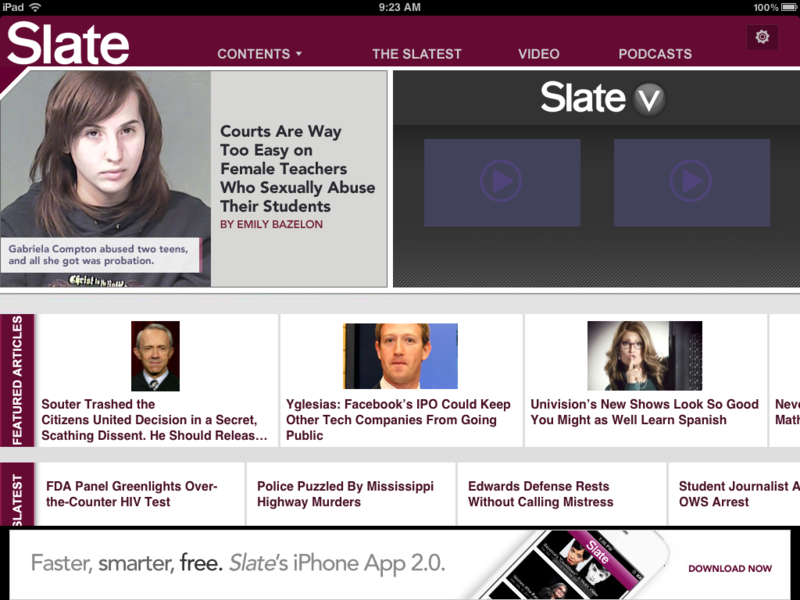 One example of that is Slate. I enjoy reading their articles so I downloaded the app. I liked it immediately and then I noticed that the bottom ten percent of the screen is a rotating advertisement for the very app I downloaded. It rotates to the android app. It makes no sense. Take a look. The funeral yesterday was beautiful. Everything worked out and thanks to my sister we had a wonderful reception. I plan to get back to this blog. I’ve written so many stories and have so much to share from the banjo to the ukulele to cycling. It’s been a rough couple years but I feel so much better. 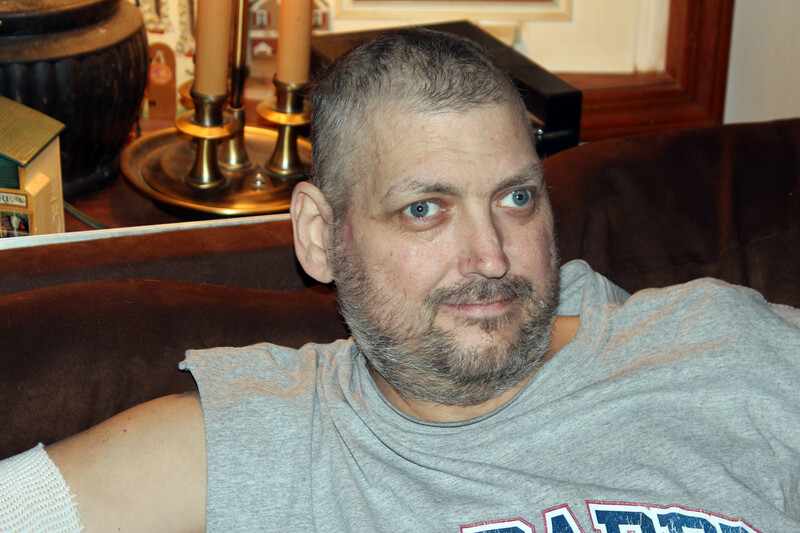 Last Thursday night my younger brother Terry died after a long bout with colon cancer. It was a long sad journey. Terry was a triplet, eight years my junior. I can remember the day my parents brought them home. We went from a family of six to nine overnight. Our family was already different having an alcoholic father and an agoraphobic mother. 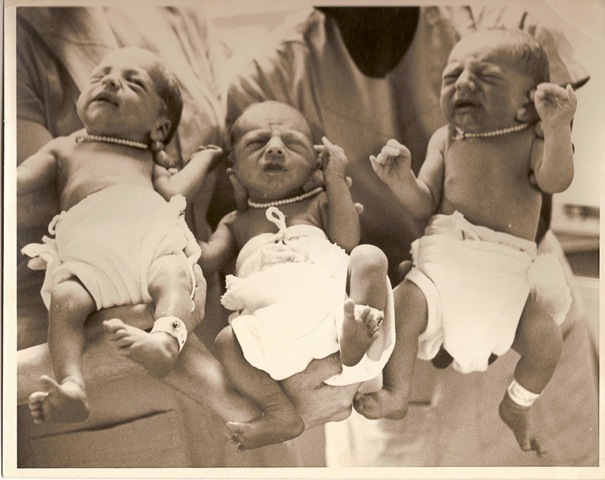 The triplets added notoriety and they were featured regularly in the local paper. There was a full page spread when they got their first hair cuts. 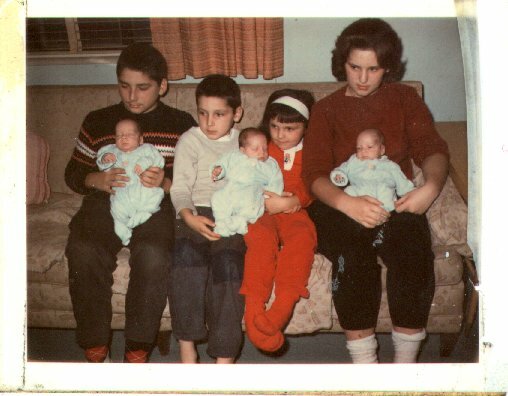 Left to right in the above picture is my older brother Brad, me, my younger sister Cindy, my older sister Debbie and then the triplets. I have so many memories of the early days. The mountain of cloth diapers that my mother was always washing. The endless boxes of baby food jars (that my father insisted on saving to store nuts and bolts that we threw away anyway). My mother would lose track of who was who so put a dot of nail polish on their ear lobe. Now if she was feeding or changing a diaper when the phone rang she knew who to go back to. But this is really about Terry. I moved out when I was eighteen and the triplets were frozen in time as ten year-olds to me. Life and work took over and I only saw them at family functions. In 1998 my older sister Debbie died from a brain tumor at the age of 47, a few days short of her next birthday. A year later my older brother Brad had surgery for colon cancer and during treatment he died of a heart attack. I was working long hours when I found out that Terry had colon cancer. It was especially troubling because it is so aggressive few in the family seem to beat it. It’s taken my grandfather, uncle and cousin. My sister worked hard to create family vacations taking Terry and the family to Myrtle Beach, Ocean City and Presque Isle. Her hard work really helped the family. Once I retired I was able to spend more time with him. I took him to doctor appointments and out and about. We talked and I found him bright and articulate. I took him to my poker group a few times and he played well, even cashing and had a great time. I had no idea he was that social. It wasn’t long before we found out how serious it was and how long he really had. His energy was diminishing and limiting what he could do. 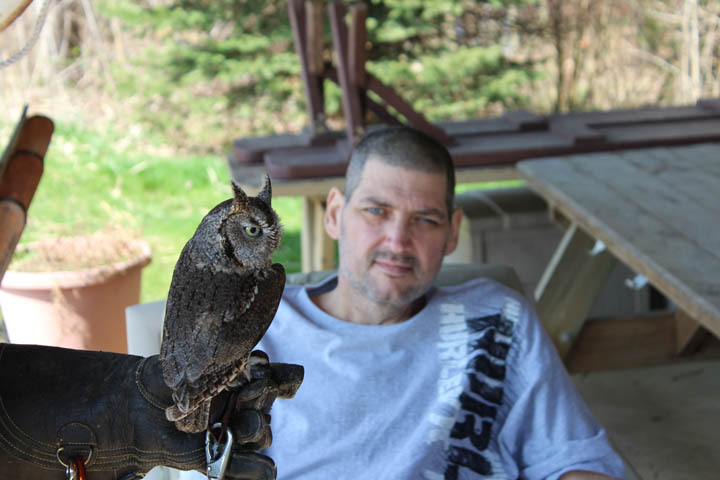 I was determined to do as much as possible with him and one of my friends volunteers at The Medina Raptor Center. He was excited about going and had a good laugh when I got lost going there. We saw many different kinds of hawks and owls and even saw an eagle. It was a thrilling day that he talked about for a long time. It was an incredibly warm February so I would take Terry for long drives. he really enjoyed seeing the country. We’d head out to Amish country or just drive along the lake. One day in February it was nearly 80 and we went to my favorite beach and just soaked in the sun. The warmth of the sun and the cool air off the lake was perfect. He was so relaxed. We sat there without talking for over an hour. The very last time we went out together was to see the new Three Stooges movie. I didn’t know it at the time but we were both Stooges fans. I’ve read every book I could find on them and so had he. The movie was much better than I expected with some real laughs. After that he barely had the energy to get out of bed. Home hospice came in and helped but it was tough. I’d go over and each day I would see him grow weaker. I’d sit there and just talk. I’d tell him the old family stories that he’d heard a hundred times or I’d just tell him about the poker tournament I had been in the night before. Through it all I was amazed at his generosity and kindness. He seemed to only care about the people he was leaving behind. I got to know the best of him at the end. 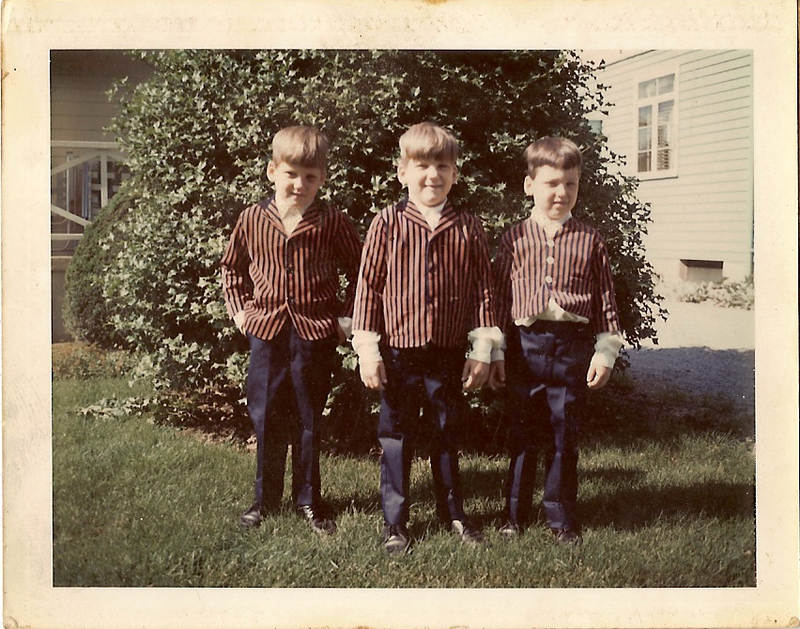 A lot of people at his wake were surprised to find that all three of my siblings died at the age of 47. It is an odd thing. Cancer claimed my grandfather at 40, my uncle at 41, and my cousin Bobby at only 35. I wonder if my father hadn’t died in a car crash at 42 if he would have developed colon cancer since he obviously carried the gene. We will never know.